There's some strange things floating around in our galaxy, but this has to be one of the weirdest. A double star system with misaligned protoplanetary disks around 450 light-years from Earth has been discovered, potentially explaining why some exoplanet orbits can be wildly eccentric. Using data from the Atacama Large Millimeter/submillimeter Array (ALMA) in Chile, astronomers have gotten a detailed look into the binary star system HK Tauri. The majority of stars form with a stellar buddy in tow, creating binary star systems, so that's not the weird thing. On viewing the protoplanetary disks surrounding each star of the HK Tauri system, astronomers found, counter-intuitively, that their disks are out of alignment by 60 degrees. That's the weird thing. Normally, when you have two stars evolved from the same proto-stellar nebula, any planet forming material that settles gravitationally into a protoplanetary disk around each star should fall into alignment. HK Tauri completely bucks this expectation. "ALMA has now given us the best view yet of a binary star system sporting protoplanetary discs — and we find that the discs are mutually misaligned!" said astronomer Eric Jensen, of Swarthmore College in Pennsylvania, in an ESO press release. HK Tauri B is the dimmer of the binary pair, but its protoplanetary disk has been relatively easy to observe through infrared and optical wavelengths as the disk can be seen edge-on from our perspective — a dark band of dusty material can therefore be seen passing in front of the star. HK Tauri A's protoplanetary disk, however, is not so easy to see as the disk is face-on from our perspective — any reflected light from the disk is therefore swamped by the blinding light from the star. With the help of ALMA, millimeter wavelengths of light being emitted directly from the disk could be resolved, revealing just how wonky the star system has become. At less than 5 million years old, these stars are a real head-scratcher. They orbit each other at a distance of only 36 billion miles (or 388 AU — approximately 13 times the distance that Neptune orbits the sun), so through gravitational interactions in the system, the protoplanetary disks should be 'leveling off'. "This clear misalignment has given us a remarkable look at a young binary star system," said Rachel Akeson of the NASA Exoplanet Science Institute at Caltech, in Pasadena, Calif. "Although there have been earlier observations indicating that this type of misaligned system existed, the new ALMA observations of HK Tauri show much more clearly what is really going on in one of these systems." Now astronomers need to find more of these young star systems to see if misaligned protoplanetary disks are common, or if HK Tauri is an oddity. Though this discovery will force some tweaks to planetary formation models, it may help explan some of the crazy orbits of exoplanets that keep getting discovered. As protoplanetary disks are the genesis of planetary formation, as planets emerge in stable orbits around their stars, any planets around misaligned binary stars could be gravitationally jostled, knocking them away from the orbital plane. As exoplanet-hunting projects like NASA's Kepler space telescope have shown, many exoplanets have wildly eccentric orbits that are hard to explain. 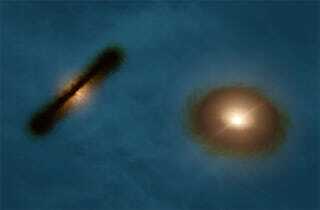 But if they formed in a star system like HK Tauri, perhaps their origin has been uncovered. Still, many questions remain. "Although understanding this mechanism is a big step forward, it can't explain all of the weird orbits of extrasolar planets — there just aren't enough binary companions for this to be the whole answer," said Jensen. "So that's an interesting puzzle still to solve, too!"